I’ve just returned from a three week trip to the west coast of Ireland, Kerry County to be exact. Beautiful country. The weather was erratic, as I’m told it is at this time of year, including rain, snow, sun and heavy winds all changing within the hour. I was there to Line Produce a feature doc-dramedy entitled, “We’ll Always Have Dingle,”about filmmaking and film festivals in Dingle, Ireland, wrapped around recreated classic Hollywood films. Become a Dingle Doc Facebook Fan. The project was produced and directed by Geoff Wonfor (“Beatles Anthology“) and produced by my good friend Diane Namm (“The Sacrifice” “Telemafia“) and Debbie Vandermeulen of Fusion Entertainment. 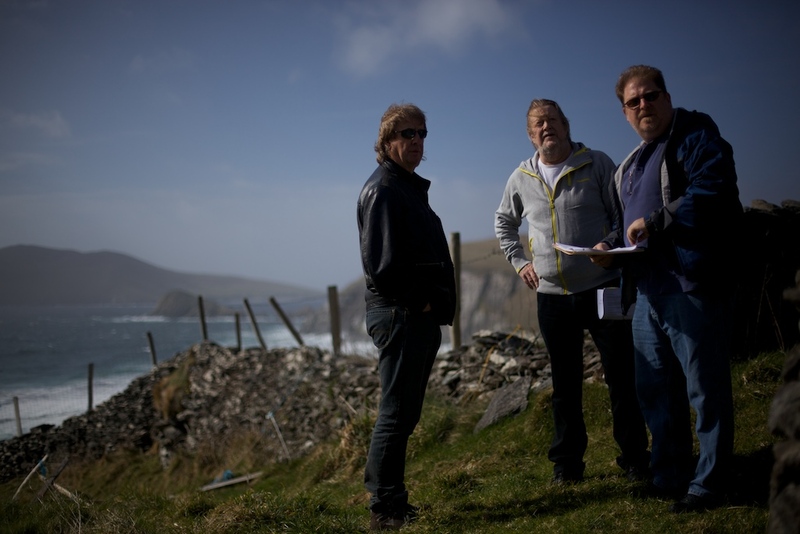 The Irish crew was top notch, including DP Eugene O’Connor, AC Conor Kelly and Trevor Cunningham handling sound duties. The real surprise was the amazing assistance from a group of ten students from the Irish training program, FAS. All were enthusiastic and creative. We couldn’t have done the project without them. For me, the highlight of the shoot was the day spent at Cuminole Beach on the Dingle Peninsula. Until recently, the peninsula was remote from modern influences and therefore, the language and traditions of the area have survived intact to a greater degree than in most of Ireland. This is evident by the local Irish news report on the production. (See it here, about nine minutes into the broadcast.) We were recreating a scene from David Lean’s 1970 film “Ryan’s Daughter” (which was originally filmed in the area). We couldn’t have asked for better weather and visibility. From the location you can see the Blasket Islands, including one that looks exactly like a giant man sleeping in the ocean. It really wasn’t difficult to understand how the Celtic myths and legends began in this part of Ireland. Dingle is a gorgeous, small fish and farming village, rich with Celtic history and known for its pubs and friendly people. I met a bunch of American ex-pats and local artists, some to surely be life long friends. Unfortunately, because of the workload, I didn’t get to see much at the actual Dingle Film Festival, but was very impressed by the crowds of avid film lovers. It reminded me of the early days of the Sundance Film Festival. After the exhausting eleven days of production, I traveled inland to Trelle, the industrial center of Kerry County. I presented a two day workshop on Line Producing/UPM and AD work for the FAS students. The students seemed real interested in the process of shooting film and television in the United States. Many comparisons were made to production in Ireland, but really, other then budgets, the differences are few. I passed around information about our OneOnOne Film Training program at the class conclusion. My last night was spent in Cork, Ireland, a city on the southwest coast. The city reminded me of a small San Francisco, but with lots more history. I visited the birthplace of the amazing guitarist Rory Gallagher and an exhibit on Medieval life in that part of the country. At the end of the night, I ended up at a pub catering to foreigners with lots of loud Americans. At that moment, I wasn’t sure I was ready to leave and get back to all that.